Weather is regarded as an important determinant of leisure choices, yet little attention has been paid to the ways that weather affects museum attendance. I find that rainfall generally increases attendance at a large national museum, on average. However, closer scrutiny of the data shows that weather can possess both encouraging and discouraging effects on attendance, depending upon the timing and persistence of the rain. Conventional wisdom suggests that rainy days present the perfect impetus to visit a museum. For would-be beach goers, playground revellers and fair-weather sports fans, the appeal of a warm and dry space to spend one’s leisure time may be too much to resist, as precipitation tilts the appeal of recreation away from outdoor activities. In the article Rain and museum attendance: Are daily data fine enough? I explore the impact that rain has on museum attendance using thirteen years of admissions and weather data for New Zealand’s national cultural museum, Te Papa Tongarewa. The research holds a number of interesting findings, not all of which support the general proposition that with rain come crowds. The central finding of the paper is that within-day rainfall patterns matter, and that analysis which fails to account for differences in people’s responses to say morning- versus afternoon-rain, may produce incomplete or misleading predictions. I find that overall, days with observed rain see a 2.8% increase in museum admissions – hardly the rush of visitors one might expect. However, using finer hourly data on rainfall and visitors, a very different picture emerges. Figure 1 Effects of Rainfall on Museum Attendance – Lines are constructed from the point estimates of regressions that predict a given hour’s admissions using hourly indicators for rain. All models include calendar week and year fixed effects, and various time-varying controls. The image above gives the predicted changes to museum attendance for two distinct rainfall scenarios, relative to days with no rain during the museum’s opening hours: persistent rain only between 9:00am and 1:00pm (morning-only rain), and persistent rain from 9:00am to 6:00pm the morning and afternoon (morning and afternoon rain). 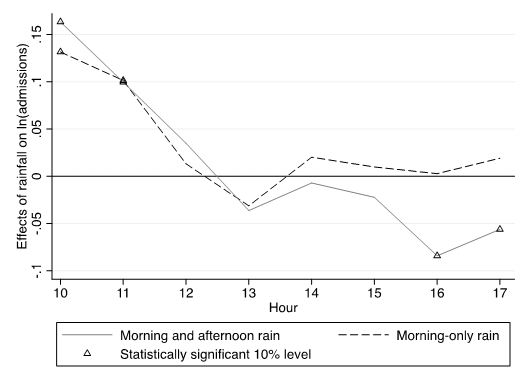 On days with morning rain, morning attendance increases between 10-16% relative to days without rain, an effect much larger than the 2.8% increase stated earlier would lead one to believe. Further, on the days with afternoon rain, attendance in the closing hours of the museum declines by as much as 9%. This figure shows that rain can have both encouraging and discouraging effects on attendance, a result which is obscured when simply considering day-level measures of attendance and rain. Even if total attendance each hour does not rise in response to rain, visitors in all time periods spend more time (measured in minutes) at the museum in response to rain, and are more likely to pay to see special exhibits. For researchers across a broad swathe of fields, the paper’s message is clear: if weather matters in your analysis, consider using widely available sub-daily data on weather conditions, in lieu of more coarsely aggregated information. Harold Cuffe, Ph.D., is a lecturer in the School of Economics and Finance at Victoria University of Wellington in New Zealand. His main fields of interest are labor economics, the economics of education, fringe credit markets and cultural economics. He has experience as a research consultant to museums.